Many Christians have been brought up under the assumption that mainstream science is incompatible with genuine Christian faith - so when they see compelling evidence for biological evolution, for example, they feel forced to choose between science and their faith. The devastating effects of this dilemma are plain to see, as emerging adults either leave the faith or shut themselves off to the findings of the scientific community. But it's a false dilemma. 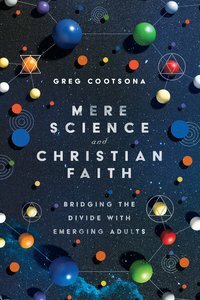 In this book, Greg Cootsona argues against the idea that science and faith are inherently antagonistic. We don't have to keep them scrupulously separated - instead, we can bring them into dialogue with one another. Cootsona brings this integration to a number of current topics in science and faith conversations, including hermeneutics, the historical Adam and Eve, cognitive science, and the future of technology. His insights are enhanced by his work with Fuller Seminary's STEAM research project. "What a great book. This sentence alone should be mandatory church wisdom: 'Let's not fool around with science that can't be supported by scientists.' Greg reflects on science, technology, faith, and emerging adults with learning, urgency, clarity, and grace." "In this book you'll find the usual suspects in books on science and religion: age of the earth, creation ex nihilo, Adam and Eve, and so on. But here you'll also find thoughtful discussions of technology, climate change, and sexuality. These latter are the topics emerging adults are more interested in, and Cootsona has been listening to them. His book is no ivory tower treatment of ideas in the abstract, but it is filled with on-the-ground insights gleaned from his extensive interaction with eighteen- to thirty-year-olds. All of us engaged in the science and religion dialogue would do well to read this book to see where our field is going. Others who have been turned off by acrimonious science and faith arguments will find a much more attractive way into the topics - and perhaps into faith itself. See that a copy of this book gets into their hands!" "Anyone who cares about why young adults are leaving churches should read Mere Science and Christian Faith. Cootsona presents up-to-date research with the sensibility and compassion of a pastor. It's an incredibly accessible and useful volume." About "Mere Science and Christian Faith: Bridging the Divide With Emerging Adults"
Gregory S. Cootsana is Associate Pastor of Adult Discipleship and College Ministries at Bidwell Presbyterian Church in Chico, California. He formerly served as Associate Pastor at Fifth Avenue Presbyterian Church in New York City.